Coffee is a drink enjoyed by people from almost all lifestyles. If you enjoy a regular cup of Joe, but still wish you had a superior appreciation for the numerous subtle tastes and experiences coffee has to offer, you need to refine your palate. Put simply, a coffee palate is a person’s ability to distinguish different coffee origins, flavors, and various roasts. A well-developed palate enables you to taste the faintest flavor in every cup of Joe. That way, your experiences are greatly enhanced. As you continue to enjoy your regular cup of coffee, your palate is continually developed and at one point you will be much more skilled at picking flavors than experts coffee tasters. It is not that professionals have sophisticated brewers or spoons that enable them to pick the different flavors in each cup of coffee. Rather, they are more experienced because of many years of comparative coffee tasting. Before you begin tasting coffee, there are a few things you need to look out for when you take a sip. They include basic terms used in flavor profile, how to smell coffee, the steps to follow when tasting coffee, Steps to cupping coffee at home and what a good coffee should taste like. Aroma is a term used to explain what your coffee smells like. An aroma is a powerful component and it is the one that helps you differentiate between a great tasting cup of coffee and an average one. Aromas that you interpret as floral or fruity are simply aromas that are being interpreted by your olfactory rather than simple notes detected by the taste buds. If you pick a strong whiff of jasmine or strawberry as coffee runs down your throat, what you taste is the aroma and not the liquid itself, as the coffee’s fragrance runs over your aroma receptors at the back of the mouth. Acids bring out your coffee’s flavor. Coffee that has a plentiful supply or citric acid will most like make you think of pineapples, lemons or oranges. Phosphoric acid has almost the same taste as citric acid. Coffee that tastes like malic acid tends to remind most people of kiwi or green apples. On the other hand, tartaric acid tends to cause coffee drinkers to think of astringent, sour grapes. Having said that, acids do not always generate a flavor. Coffee with a citric taste will not necessarily taste like oranges or lemons, the same way malic acid will not always remind you of apples. An acidic sensation is what you should be looking for. In some cases, the taste is somewhat familiar, like when your coffee has that sour, crumpling sensation that can only come from tartaric acid. Whereas, in other cases, the taste is a little more subtle. When that happens, all you have to do is find a flavor that narrowly pairs with your sensation and explore it further. As complicated as that may sound, the idea here is to explore your senses and allow your experiences to shape your current one. What you need to ask your self is whether coffee tastes sweet to start with. And if it does, how would you describe this kind of sweetness? Does it qualify as caramel sweet, or does it border on honey sweet? Would you describe it as sugary sweet? If your cup of Joe is not sweet, would you say it is bitter? You could also characterize your coffee as being bitter and chocolatey. Some people describe coffee as tasting like over brewed tea while others think it would qualify as bitter hay. 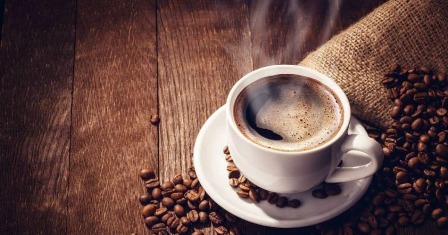 In some cases, the coffee may have been roasted for far too long making it taste like ash or carbon. Here is a shocker for you. Great tasting coffee is not exactly sweet. It usually has some bitterness to it. When the bitterness is well controlled, your regular cup of Joe tends to have a rich yet full taste. This aspect is most of the times ignored, but we consider it as an important note. This term is determined by what you feel when you swallow the coffee. Does it feels acidic, burnt, smokey, bitter etc? If it does, than the coffee was harsh whereas the cleaner coffee offers neutral taste after swallowing. This characteristic is often directly affected by roasting. 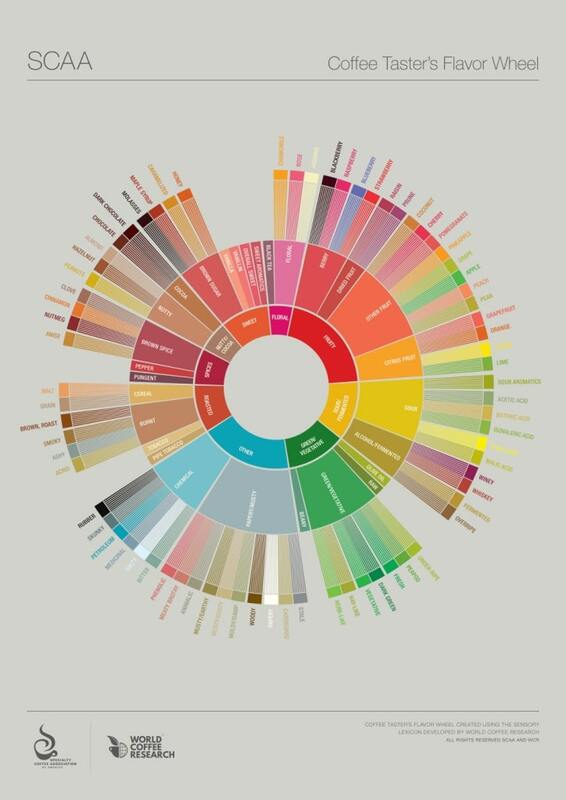 Here is a complete coffee flavor wheel telling about all the notes you need to know about. Learning each of these seems tough, but once you get hold of it, there is no fall behind. Your taste buds greatly influence your ability to smell. Therefore, before you start calibrating your taste buds, ensure that your nostril is clear and free and that you can easily smell and breathe everything in your surroundings. When it comes to assessing the smell of your favorite brew, identifying certain characteristics is much more challenging than when tasting. Your brain’s receptors, the once responsible for processing smell, find it quite tough to explain what they are picking up. You need a lot of practice, some fun as well as intensive training to become expert at smelling coffee. To ensure you are able to explain what your nose is picking, you need an 8 oz chowder, one for each of the coffee you will be tasting (smelling), 13 grams of each type of coffee for a thoroughly comparative experience. Once your coffee is well grounded, place it into each cup. Pick each cup and tap gently to release the aroma. Get your nose closer to the cup and smell the coffee as deeply as you can. Pull your cup away and breathe out. Repeat the same procedure once more. Before you brew your coffee, the grounds emit the most fleeting aroma. Experts refer to this as fragrance or coffee’s whiff. Next, pour in some boiling water to the brim of each cup and ensure all the grounds are well saturated. Once each cup is full, place your nose closer to your cup’s surface, and then inhale the vapor deeply. Note the difference in smell. This is what coffee enthusiasts call the aroma or coffee’s smell when it is being brewed. Aroma is easier to pick by smelling because moisture within the vapor allows the aroma to hang around much longer in your nostrils. The processing method used here has a high influence on how your coffee is going to taste like! Cupping is perhaps the easiest way to understand a little more about aroma and flavor. Good coffee is tastes great, nearly all the time. However, it really helps if it tastes great in a medical or even leguminous manner. Before you begin smelling, grind your coffee. Smell your coffee grounds and take time to think about what your nose picked. Next, pour some hot water into each cup with grounds. Ensure the water is enough to cover your grounds. Allow a minute to elapse so that the coffee can bloom. Set a timer for about four minutes and once it goes off, smell your coffee. Think about the experience and try to describe it. Do not shy away from placing your nose very close to the cup until it almost touches the coffee. In this step, take out your spoon and gently push coffee grounds away from your coffee’s surface to release another dose of aroma. Then, scoop all the floating coffee grounds and discard them. Fetch a clean spoon, scoop some coffee and take a sip as slowly as you can and let the coffee interact with every part of the tongue. Feel exactly how your coffee tastes like in the coffee palate. Discuss, note or have fun with your fellow guys! Your taste is directly linked to your sense of smell. When you want to taste coffee, begin by smelling it. Place a hand over the coffee mug then hold it close to the nose and breathe in. Think about what your sense of smell is telling you and then try to describe that aroma. When you are tasting coffee, slurping it is usually a good idea. If you slurp, the coffee will be distributed over your entire palate. That way, all those subtle aromas,and flavors will reach your tongue’s tasting zones. As you are tasting your coffee, try to figure out which part of the tongue is experiencing the aroma. Also, take note of the coffee’s weight on the tongue. Find the right descriptive terms to describe the main characteristics of the flavor and aroma you picked and the exact feeling the coffee brings in the mouth. Use your experiences as reference points. Find foods or other similar experiences to compare it with. Good quality coffee should have a balance between sweetness, bitterness, and acidity all in a single scoop, with very few off-notes. Essentially, this is coffee speak for a great cup of Joe should taste great. For your cup of Joe to be considered great tasting coffee, it should not taste like it’s charred, or burnt. There should be both a complex and nuanced flavor. It should feel smooth to the taste and may have floral, fruity or an earthy flavor. Great coffee should cause you to crave another sip without milk or sugar. If you are hoping to taste coffee like a professional and appreciate its nuanced flavors, you need to develop your coffee palate. That means working as often as possible. If you work on improving your palate more often, your palate will develop much faster. However, ensure you understand what great coffee should taste like, then follow all the cupping steps so that you can fully develop your palate.